This morning, we are all waking up from an excellent Academy Award show. Congratulations to all the winners, but I want to give a special shout out to Call Me By Your Name (and James Ivory) for winning in the Adapted Screenplay category. The novel the movie is based on, by Andre Aciman, has long been a favorite of mine. With that in mind, I am going to highlight books this week from authors who have been around for a while, but whom you may not have yet read. Why not give them a chance – you could be reading a book that one day becomes an Oscar-winning screenplay. 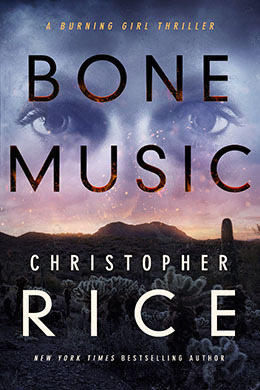 Christopher Rice starts a new series with Bone Music. This one is an interesting blend of mystery, thriller, and paranormal. Charlotte is character readers are going to become attached to – she’s been through a lot and Rice seems poised to put her through a hell of a lot more before it is all over. Except from now on, if anybody is going to control Charlotte, it’s going to be Charlotte herself. She’s determined to use the extraordinary ability she now possesses to fight the kind of evil that shattered her life—by drawing a serial killer out from the shadows to face the righteous fury of a victim turned avenger. This thriller with the unlikeliest of heroes will keep you turning the pages long into the night. Orloff marries a gripping plot with a clever conceit (a villain who believes himself to be a fictional character and that character’s creator who gets a bit of wish-fulfillment in helping to capture him). At the center of it all are the characters – both “real” and fictional – whom readers are sure to respond to. Here’s hoping we see a few of them again in the future. Can former best-selling novelist Mathias King—now a rumpled, grizzled English professor—save America from a terrorist of his own making? In the shadow of the Pentagon, a secret DoD brain research experiment goes terribly wrong, and an ex-Special Ops soldier escapes, believing he is Viktor Dragunov, the Russian operative from the 80’s thriller novel, Attack on America. To capture him, the Feds turn to the person uniquely qualified to predict his next moves, the man who created the fictional character, best-selling author Mathias King. Now a reclusive English professor, King is reluctant to get involved, having sworn off the culture of violence after a deranged fan murdered his wife. But when innocent people start dying, King is thrust back into that dark world. With help from his enthusiastic graduate assistant Emily Phan, King must outsmart his own creation—while outmaneuvering the cover-up-loving Feds—before Dragunov succeeds in his hell-bent mission. This young adult series debut is perfect for readers who love a good academic mystery. Set within an exclusive boarding school, these kids need to rely on their own set of skills to figure out what evil roams the halls. Boys who are reluctant readers may just respond to Luke and his dilemma. Luke Chase—yes, that Luke Chase, a modern hero ripped from the headlines—didn’t mean to get caught up in Mrs. Heckler’s murder. He just wanted to hook up with the hot new British girl at St. Benedict’s, and if that meant sneaking out to the woods after hours, then so be it. But little did he know someone would end up dead right next to their rendezvous spot, and his best friend and roommate Oscar Weymouth would go down for it. With suspects aplenty and a past that’s anything but innocent, Luke Chase reluctantly calls on his famous survival skills to find the true killer. For fans of “A Study in Charlotte” and boarding school lit, “Sneaking Out” (book one in the “Chased” series) immerses readers in the privileged prep school world, with a mystery that exposes the dark side of life on a residential high school campus. I know I have a fair number of golf fans – players and watchers – who visit the blog, so this cozy mystery series centered on the sport might be just what the caddy ordered. The author herself is a golfer, so expect an insider view of this tough, but beloved, pastime. 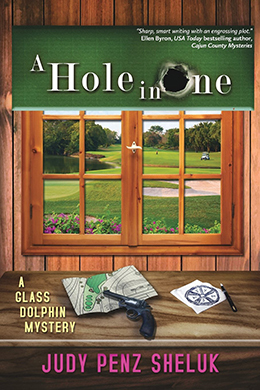 Hoping to promote the Glass Dolphin antiques shop, co-owners Arabella Carpenter and Emily Garland agree to sponsor a hole in one contest at a charity golf tournament. The publicity turns out to be anything but positive, however, when Arabella’s errant tee shot lands in the woods next to a corpse. They soon learn that the victim is closely related to Arabella’s ex-husband, who had been acting as the Course Marshal. With means, opportunity, and more than enough motive, he soon becomes the police department’s prime suspect, leaving Arabella and Emily determined to clear his name—even if they’re not entirely convinced of his innocence. Dogged by incriminating online posts from an anonymous blogger, they track down leads from Emily’s ex-fiancé (and the woman he left Emily for), an Elvis impersonator, and a retired antiques mall vendor with a secret of her own. All trails lead to a mysterious cult that may have something to do with the murder. Can Arabella and Emily identify the killer before the murderer comes after them? 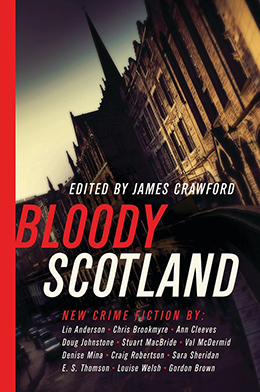 This unique collection includes many of my most favorite authors of crime fiction – Scottish or otherwise. 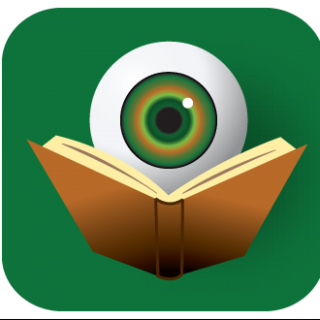 Stories by Val McDermid, Ann Cleeves, Peter May, and Denise Mina – among others – will make you look at architecture in a new and nefarious way. Twelve of Scotland’s most famous crime authors evoke the sinister side of the country’s architecture in stories that are by turns calculating, chilling, and redemptive. Scotland has often been depicted as a land of haunting, misty moors and literary genius. But Scotland has also been a place of brutal crime, terrifying murder, child abuse, and bank robbery. Crime can strike anywhere. From the southern border to the Northern Isles, suspicion and suspense are never far away. Edinburgh, with its reputation for civility and elegance, has often been the scene of savagery; the dark streets of industrial Glasgow and Dundee have protected thieves and muggers, while the villages of coast and countryside hide murderous men and wild women. Stellar contributors to Bloody Scotland include Val McDermid, Christopher Brookmyre, Denise Mina, Peter May, Ann Cleeves, Louise Welsh, Lin Anderson, Doug Johnstone, Craig Robertson, E. S. Thomson, Sara Sheridan and Stuart MacBride explore the thrilling potential of Scotland’s iconic sites and structures. From murder in a Hebridean blackhouse and a macabre tale of revenge among the furious clamour of an eighteenth century mill, to a dark psychological thriller set within the tourist throng of Edinburgh Castle and an ‘urbex’ rivalry turning fatal in the concrete galleries of an abandoned modernist ruin, this collection uncovers the intimate―and deadly―connections between people and places. Prepare for a dangerous journey into the dark shadows of our nation’s architecture―where passion, fury, desire, and death collide. Thanks for including A HOLE IN ONE! One more sleep to release day and a few more sleeps before golf starts where I live…here’s hoping this year I get my first hole in one…minus the corpse in the woods, of course. I am hoping that happens for you, Judy. But definitely minus the corpse – that would certainly put a damper on a round of golf. Glad to see this list (as well as last night’s show). I’ve enjoyed three of the ones you included, but will now read the other two. 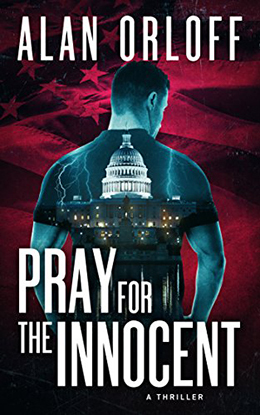 Thanks for mentioning PRAY FOR THE INNOCENT here (and I’m glad you liked it). However, I fear I must stop reading your blog–my TBR pile is much too high!!!! I hear that lament often, Alan. I stand by the motto that there is not such thing as too many books. Great list, Kristopher! 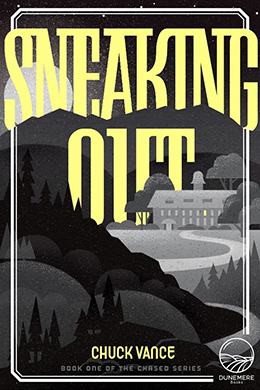 I love me a good boarding school mystery and I’m definitely going to grab a copy of SNEAKING OUT. Thanks for putting it on my radar. Congrats to everyone on their releases, with a special shout-out to Alan Orloff on his latest. Sounds awesome! Thank you from Dunemere Books for listing SNEAKING OUT, Chuck Vance’s debut novel! We are excited to see it here! Happy to include it, Elizabeth. I hope that many of my followers will check out this enjoyable novel.